The last days of HOWS: Now open, for now, originally uploaded by LA Wad. The Safeway anchors a 6-story residential live-work complex at the corner of 4th & King streets. Parking is well-hidden. The store is premised on walk-up traffic. This intersection is where two streetcar lines run, as well as the end of the line for the commuter rail service to Silicon Valley. Plus, one block to the east is AT&T Park, home of the San Francisco Giants. Safeway has a very good prepared food section. Of course, supermarkets are in one way how Northern and Southern California are sometimes two different planets. In the Bay Area, Safeway tests urban format stores like this. In Southern California, Safeway-owned Vons closes down all its stores in low-income and majority-minority neighborhoods. I didn’t know this. When they opened the store, they had one of the ugliest and most poorly conceptualized advertising campaigns. I wonder who even knew about them. Metro riders, for one. HOWS did a very good job making its presence known in the community, especially on public transit. The only advertisements inside Orange Line buses were for HOWS. Plus, for most of last year, HOWS advertised inside the North Hollywood subway station and the car cards on the trains, too. I really have to applaud HOWS for doing that. It made an earnest effort to build its clientele. Ugly? Maybe. 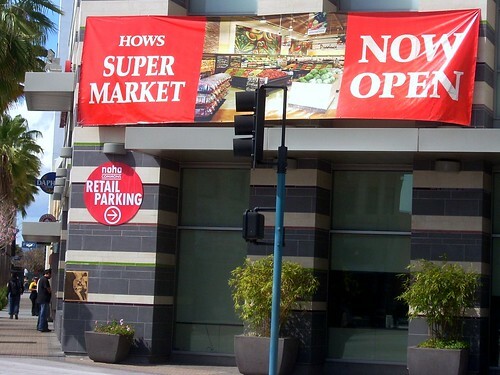 But HOWS ad campaign was just limited to “HOWS (logo) Now open in North Hollywood near the Red/Orange (depending on what you were riding) Line station” and pictures of cuts of meat and produce. That was it. LAist and Michael Higby’s North Hollywood blog had commenters who are disheartened by the news. But the biggest complaint was the high prices. Most people said Ralphs was cheaper. This confirms that much of the development around the North Hollywood transit area has been badly designed because it is too far away from the people who walk into the train station. If one block is too much of a burden for people to walk, then maybe people are the problem. In L.A. people will find a reason to snivel if the developments were where the local buses turn around. The NoHo Commons restaurants are doing well. Panera and Big Wang’s are the most popular. Pitfire Pizza, all the way down at Magnolia, has been going strong at its North Hollywood flagship. (It now has four locations). Another longtime tenant is Tokyo Delve’s. I do agree with you about bad design in one sense, and it pertains to HOWS specifically. This is not how you do an urban format market. HOWS might be doing well if it had placed its entrance at the northeast corner of the NoHo Commons retail area. It would have at least interfaced with the street, and it still would have allowed shoppers to push their carts to the parking area. Its one and only entrance was hidden. The anchor tenant did not do anything to encourage strolling past other stores, as is the case in shopping malls. Shoppers have to know where to go. In the standard supermarket format, shoppers immediately know to park their cars, turn their back to the street and walk to the door, at the center or off to the left or right sides. Supermarkets are wary of the urban format because they’ve lost the ability to make it work. Ralphs, which originated in downtown L.A., had very little confidence when it returned there in 2007. They believed an urban format was unworkable. They took a cautious bet that paid off well. The 9th Street Fresh Fare became one of Ralphs top 15% grossing markets in its first year of operation. It was not Ralphs’ first urban format, though. It inherited the Miracle Mile Alpha Beta in the mid-1990s. Miracle Mile’s specific plan forbids parking facing Wilshire Boulevard. Ralphs buried the parking and lifted the store half a story above street level. Fortunately, though, the sole entrance was facing Wilshire, so even drivers had to come through the front. (They can take carts down an elevator or a motorized walkway built on an incline). The Ralpha Beta was not necessarily a ringing endorsement of the urban format. Ralphs probably kept the Miracle Mile location because it was the newest. After the great 1990s market consolidation, it had to unload the 3rd and Fairfax location (now a Whole Foods) because of antitrust laws. It also closed its Beverly Connection store. The Miracle Mile and Downtown L.A. locations are two examples of how to work in an urban format store. HOWS is a cautionary tale of how not to do the urban format.